The kanji character means strength. We integrated the character into the logo to form the word know. 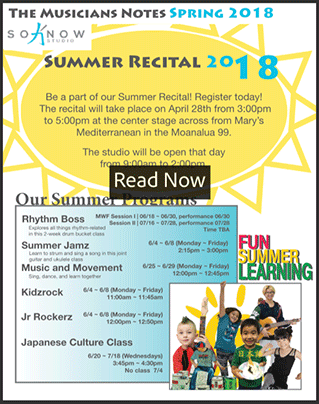 SoKnow Studio is Honolulu's premier music and language education source. We use technology, creativity, and traditional instruction to motivate and empower success. 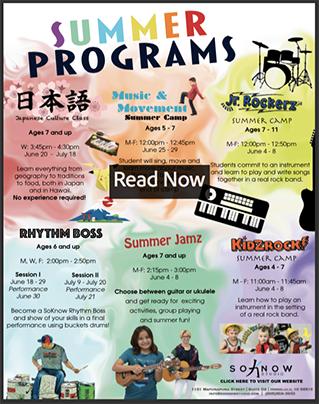 Our excellent instructors instruct children and adults alike in the guitar, piano, ukulele, cello, violin, drums, and vocals. Our team can also teach your children any level of japanese. We have a great studio in which we offer private and group lessons! We sell a wide variety of books for piano, cello, violin, ukulele, and voice. We can also special order books if needed - please contact us for more information and available titles! You can visit our online book store by clicking the sheet music direct logo below! Our teachers have years of experience and knowledge they would love to share. We offer a class or program for any age! Feel free to complete our registration forms by clicking on the links below prior to scheduling a class, this will save time should you choose to sign up!